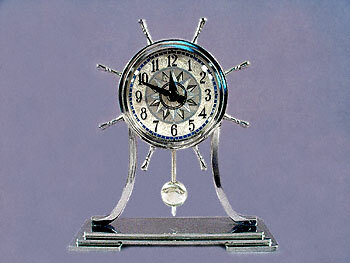 This is a chrome plated ships wheel electric clock made by the Howard Clock Corporation of Chicago probably in the early 1940s. It stands 10" tall, is 8-7/8" long at the base, and has the time set and starting knobs on the back. This clock has been serviced, and runs quiet and true with the electric pendulum swinging from side to side. There is some minor pitting on the surface and rear of the base, however the rest of the clock is in very good condition with some scuffing normal with its age. The showpiece of this clock is the silver, blue and black face; it is exceptional both in its condition and design.